One of the most joyous parts of owning a pet is cuddling. Many of our dogs seem to love having their bellies rubbed. They happily flop on their backs, tongue lolling and tail wagging as they await tummy scratches. But why? What's so great about having your belly rubbed to a dog? Dogs expose their bellies to us for two main reasons: as a submissive display, and as a request for a belly rub. It's important to know what your dog is telling you before you go in for petting! Dogs adopting a submissive display (also called an appeasement display) are trying to diffuse social tension by showing that they're not a threat. Petting a dog who's showing submissive or appeasing behaviors can make the dog more nervous, because now you're touching him in very vulnerable parts of his body! Most people find it easiest to watch the dog's tail and mouth—but keep in mind that a wagging tail doesn't equal a happy dog. A tucked, stiff, fast tail wag is not the same as a full-body, loose tail wag! 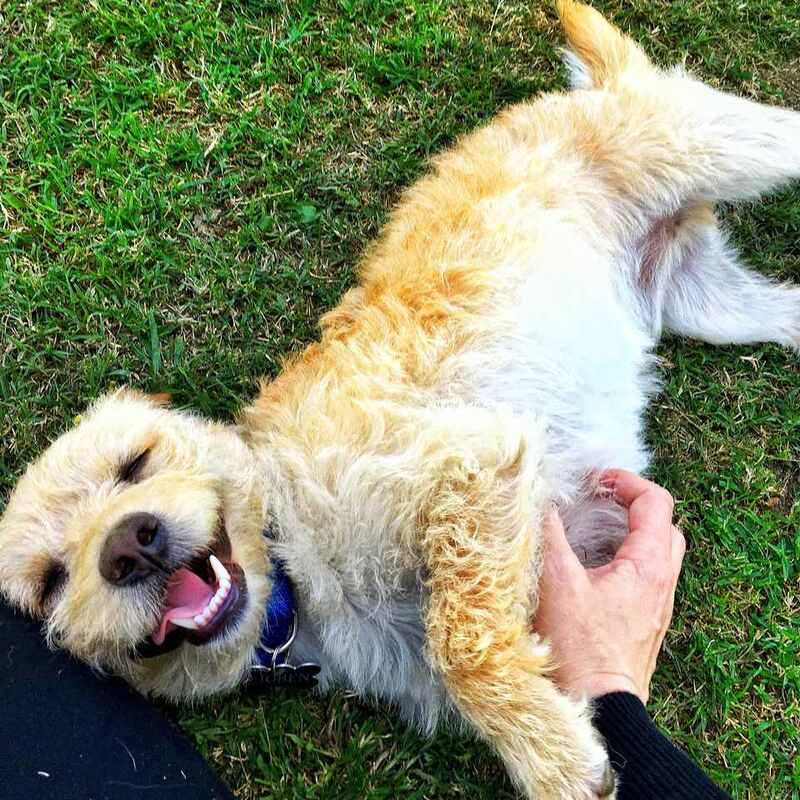 It's hard to say exactly why dogs love belly rubs—we can't ask our pets! Since dogs can't easily scratch their own tummies, they're more likely to rely on humans for help. Many dogs also enjoy rolling in carpet or grass to really itch their backs. Anecdotally, it seems that many dogs seem to enjoy getting a belly rub while they also scratch their backs. They can reach their own shoulders, necks, and face with their hind feet. But they really don't have a good way to scratch their own tummies! Think of how nice it feels to have someone rub your back or scratch an itch that you can't reach. No wonder dogs love getting a helping hand with their belly rubs! Not all dogs love belly rubs. Most dogs don't always want a belly rub, either. If your dog doesn't love belly rubs or doesn't want one right now, it's no big deal. Some dogs just aren't into it, or maybe your dog just isn't in the mood. Many dogs really only enjoy belly rubs in the morning when serotonin levels are highest, or when they're really relaxed. Watch to see if your dog is actually asking for a belly rub. Check the body language listed above. If your dog doesn't seem to want a belly rub right now, don't push it. The best way to teach your dog to trust you and love belly rubs is to respect him when he says "No, thank you." Kneel down. Keep your body language loose and relaxed at first. Rub the belly! Try open-palmed, fingernails-in, circular, or even patting motions. After 3 to 5 seconds, stop petting. See what your dog does next. If he paws at you, stays put, or otherwise shows that he'd like more petting, go back in for more! If he gets up and leaves, belly rubs are over. Try changing up what sort of petting you use and see what different results you get. You might be surprised to find a new type of belly rub that your dog loves even more. The most important thing is to respect your dog's wishes and pet him the way he'd like to be petted. If you listen to your dog's body language, you will actually make your dog love belly rubs even more than he already does!